It's summer everyone and soon (21st of June) will be the Summer Solstice and the longest day of the year. To celebrate i am holding a 30 % off sale in my shop. So if you have an item you love but didn't have the money for, now is the time to snap up all those bargains. Every item in my shop is 30 % off that's stickers right through to original framed pieces. To take advantage of this offer just click on the picture above to be whisked to my shop and then add the items you want to your basket. 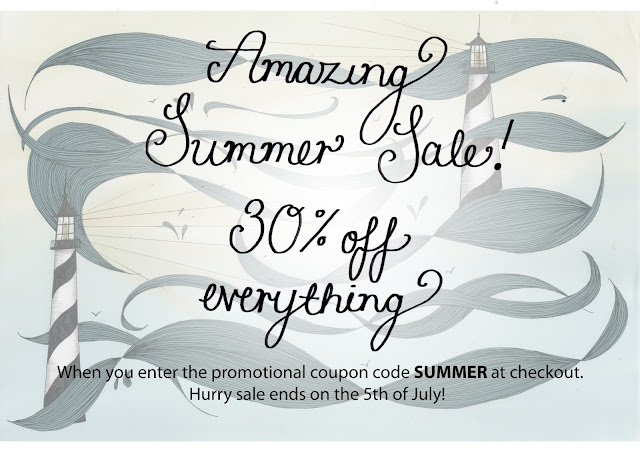 At the checkout enter the promotional code SUMMER and receive 30% off your purchase. So if you wanna be smart order each item separate to receive 30% off each rather than 30% off the total basket value. Hope you have a lovely day and lets keep our fingers crossed that the sun keeps shining.